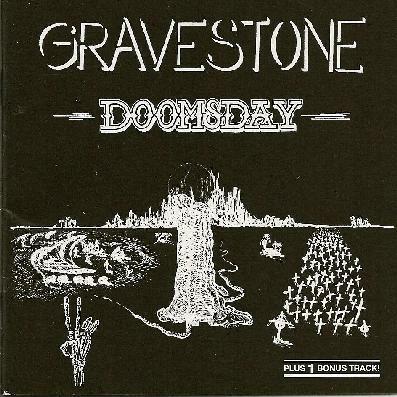 Gravestone play somewhat somber Progressive Rock of a rough nature. This is a re-release of their 1979 album on the Garden of Delights label. The music is at times jazzy and bouncy, and there are hints of blues throughout, and thankfully the majority of the tracks are instrumental. This is because the vocals are not to my liking sound wise, a bit off as it were. Lyrically though, the message that they are trying to get across is agreeable, they are just not that pleasant to listen too. “Our world is good, our world is right. Please don’t try to change it, for then you have to die. Everybody tries to be a big king; money is the only counting thing. There is no time to pray, and no fear of Doomsday.” There is a lot of improvisational blues styled stuff going on here. The guitars are the main lead instruments, although there is an organ tickling the background, the guitars are full front, screaming in true psychedelic fashion on the latter tracks of this eight track album. As far as whom they sound like, I can hear bits of Barrett era Pink Floyd, in the freak out blues jam sessions, and I can also hear Quintessence in the same freak-outs. Also there is a hint of Igra Stacklini Perli in there as well, and thankfully the majority of the album is in this style, yet the songs with lyrics tend to be a bit more mellower than the chaos of the improvisations.